Where do B2B marketers start with voice searches? As individuals, AI assistants and smart speakers such as Alexa and Siri are now a familiar partner in many peoples' everyday search for answers, solutions and content. But since they’re usually more closely associated with B2C brands, do B2B marketers really need to worry? “Siri, where’s the nearest seafood restaurant?” and Alexa, do I need my raincoat today?” are examples of popular voice commands that help us navigate through our daily tasks. But voice command is a revolution that's set to infiltrate our working lives too, which is why B2B brands must pay attention. AI is still perfecting itself. By using machine-learning technology, it becomes more intelligent and intuitive. It determines intent and context. And it improves the accuracy of algorithms and the content it delivers to us. One-fifth of queries of Google are now voice searches. This is predicted to grow to 50% by 2020. And around 30% of searches will be done without a screen by 2020. What's more, 50% of people now feel comfortable using voice search alone in an office, and nearly 25% feel comfortable in front of coworkers. 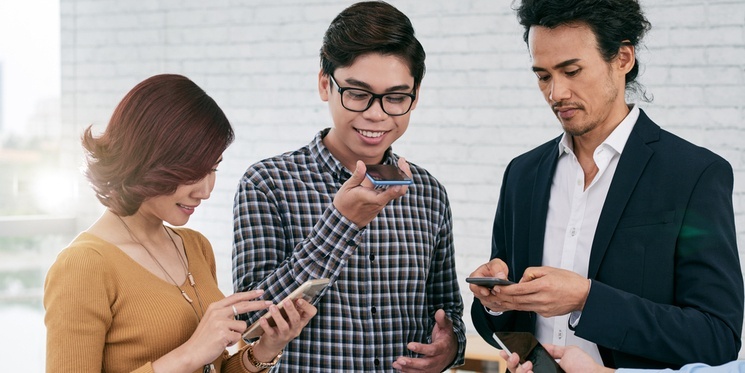 We then have to consider the influx in Millennial and Gen-Z employees, 'road warriors' and remote workers - all of whom are responsible for a growing preference in voice search. The tools that support us in our day-to-day work are evolving to become quicker, easier and more efficient. Voice search is bringing us closer to a world where the casualness of speech will seep into our relationship with the internet and, as a result, how we interact with and access content online. Voice queries contain conversational language and are usually longer than regular desktop searches. While text input sits around an average of 1-3 words, speech searches are longer, between 7-10 words. Understanding the nuances of voice search will give writers and marketers a better steer on how they can modify their content to satisfy voice searchers too. Of course, we search differently when using voice recognition. General intent, for a start, can be significantly different. Question phrases such as 'what, who, how, when and where' will help you determine the degree of intent. 'What/who/how' suggest interest (awareness/consideration stage), while 'where /when' questions suggest the user is closer to taking action (decision stage). A content audit might be necessary so that you can identify gaps in your content strategy. You should equip yourself with sufficient content to satisfy every stage of the buyer’s journey. Your content should answer queries at awareness, consideration and decision stages. Think about what kinds of spoken questions and phraseology might follow ‘What’, ‘Where’, ‘When’ and ‘How’, for example. Keywords and key phrases are still going to be core to your SEO strategy. Using SEO tools such as SEMRush and Moz’s Keyword Explorer will enable you to identify which phrases garner the highest volume of searches. Voice searches will often pull information from the featured snippet box - often referred to as the #0 position (better than number 1). According to Ben Goodsell, the click through rate for a page increased from 2% to 8% after being featured in position #0. It also means additional brand exposure in search results. However, snippet information is only presented by Google for high-volume searches. If you can position your content for those questions that are asked the most, and aim to offer a concise and straightforward answer, your content is more likely to be featured by Google when it serves up answers for high volume voice searches. Voice searches have one thing in common: they are driven by questions. By placing a focus on answering as many relevant questions as possible, you raise your chances of ranking higher for them. Q&A/FAQ pages are not new, but a broader approach will help you align your content with the most common questions that your prospects and customers are likely to ask. Many B2B brands have existing FAQs or Q&A pages. But they are generally answering questions about their products and services, which may not reflect high-volume search. So by expanding your approach to answer broader questions, you will give yourself a better chance at being a featured snippet. We often speak about the value of interviews in building your buyer personas. Speaking with real customers and prospects - gaining "coal face" insight - can be extremely valuable. But the interview transcripts also can help you position your content to answer the sorts of questions real people have. Interviews and adapting your buyer persona research to include insight into customer questions and values will bring you closer to the types of queries that are more likely to resonate with search engine algorithms. You can transcribe the answers to those queries, making them explicit and readily available for search engines to extract them. In the same vein, video content is also worth considering. Webinars or informative videos with a written transcript, like Moz's ‘Whiteboard Friday’, are full of direct answers. The preference for voice search continues to grow along with other SEO trends that will shake up our strategies. B2B and B2C brands must pay attention to the evolution in how users interact with technology. Small tweaks to your content can deliver returns in the eyes of Google. All in all, Google will favour those that provide the most relevant, useful and easily-digestible content. B2B brands shouldn't ignore the rate at which voice search is growing and its inevitable implications on SEO. We should respond appropriately, aligning content with the expectations of the new-style searcher.